A few hours ago, the Japanese space probe Hayabusa 2 touched down on the soil of asteroid Ryugu to collect some samples of regolith, the soil’s surface layer, which will be transported back to Earth. This is the first of the three possible attempts and now the Japanese space agency JAXA will have to assess whether to look for another area on the asteroid and proceed with a second attempt. 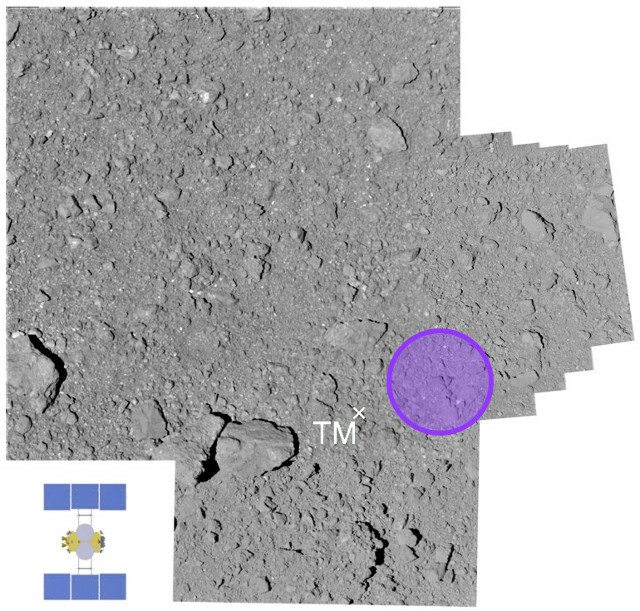 The Hayabusa 2 space probe reached the Ryugu asteroid between 26 and 27 June 2018. In the following months there was a slow but important activity with the study of Ryugu from a distance, the orbit entry and the landing of some little rovers called Minerva and the Mascot lander. All this allowed to begin to understand the characteristics of this asteroid, including those of the ground to find the most suitable areas for the touchdown attempts, to collect samples. The surface of asteroid Ryugu isn’t what was expected. The idea was that it was covered with dust, instead it turned out to be gravely, as the short clip posted on Twitter by JAXA shows. On the ground there are also many rocks that make the Hayabusa 2 space probe’s descent particularly dangerous. For this reason it took longer than expected to find an area deemed suitable for the first attempt but finally the maneuver was completed. The force of gravity of asteroid Ryugu is very weak but must be taken into account. The descent maneuver of the Hayabusa 2 space probe lasted several hours and was carried out at a very low speed: starting at almost one meter per second, it was reduced to ten centimeters per second in its final phase. It’s not correct to call it a landing because the contact with the ground lasted only time to shoot a bullet in the ground and try to collect samples of the regolith that got ejected, hoping that the soil wasn’t too hard to break up, then fly up again. JAXA confirmed that the operations have gone as planned, however the Hayabusa 2 space probe has no sensors capable of measuring the effective capture of regolith samples. Now it will be necessary to decide whether to proceed with other samples collecting operations in other areas, which will depend on the risk assessments, which will be determined by the soil conditions. Asteroid Ryugu’s soil proved to be insidious due to the presence of rocks, but each sample collection increases the chances of finding something particularly interesting to understand the structure of Ryugu and perhaps if the water on Earth also arrived from asteroids of that type.